Adults £4, children £3, under 2s free. 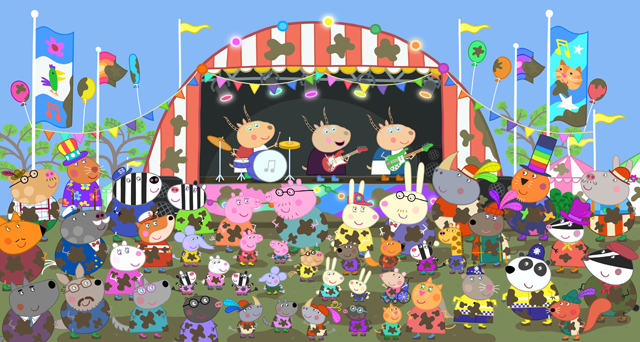 Join Peppa and George in their brand-new adventures as they dance at a children’s festival, with songs to sing along to and games to play. Celebrate 15 years of Peppa Pig with a special cinematic outing. Join the party with Peppa and George in their brand-new adventures as they dance in the mud at a children’s festival, celebrate Grandpa Pig’s birthday at a restaurant for the first time, and take a trip to the cinema to see Super Potato’s big movie feature! With songs to sing along to and games to join in with, this is perfect family fun. This film should be available in audio described format but this is subject to confirmation upon final testing prior to screenings. Please therefore contact the cinema prior to booking at info@saffronscreen.com to ensure that audio description is available.